A sleek and contemporary dimension lifts this traditional Country Manor House and places it smack bang in the 21st Century. Picturesque location and state of the art spa and beauty suites. This handsome looking country house with its elegant ivy-clad façade has been enchanting visitors to Mollington since its construction in 1853. The 63 bedrooms are all en-suite and designed with in a sleek and contemporary fashion, with many of the rooms featuring scenic views of the hotel grounds and the surrounding countryside. This first class hotel offers six conference suites that can be used for receptions, banquets and business meetings and a state-of-the-art Health and Leisure Club with gym, indoor swimming pool, sauna, Jacuzzi and beauty spa. 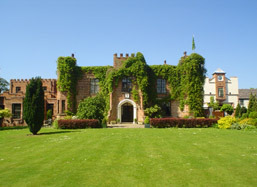 The 4 star sits in several acres of private landscaped gardens just 2 miles from historic the centre - making it great for visiting Tatton Park, shopping along the 'Rows' and trips to Chester Zoo.